We have finished building our bunkhouse which is over 7,000 sq. feet. 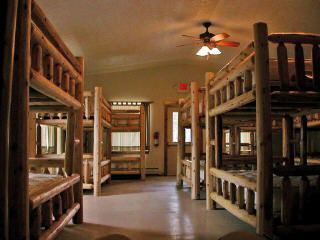 It features four rooms that each have eleven handcrafted log bunkbeds making them able to sleep 22 people to a room. 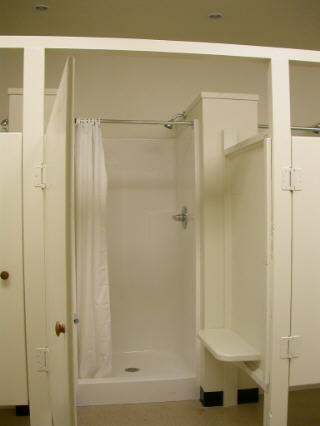 Each room has it’s own shower/ bathroom with individual private shower stalls. The bunkhousse has two main meeting rooms for groups to gather and relax in. 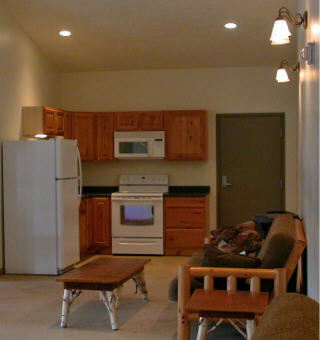 There is also a kitchenette that groups can reserve to cook for themselves. We have a large lounge area for guests to hang out and relax in after a long day of skiing on the mountain. There is a small kitchenette that groups can reserve to cook their own food if they want. There is also a tv w/ satallite service in the lobby. 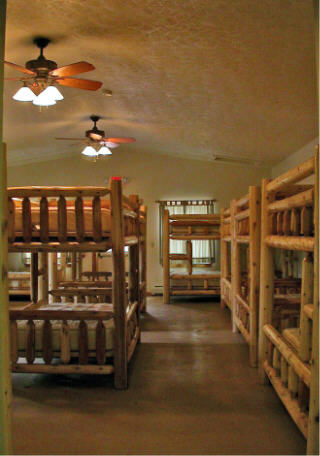 Each bed is a solid handcrafted log bed offering the room a unique feel and look. Each room has it’s own bathroom/ showerroom with individual private shower stalls!